Wheelmap is a crowd-sourced, online map to search for, find and mark wheelchair accessible public places. With almost 500,000 venues tagged since 2010, it ranks as the world's most extensive tool for locating wheelchair accessible places. It is currently available in 22 languages. 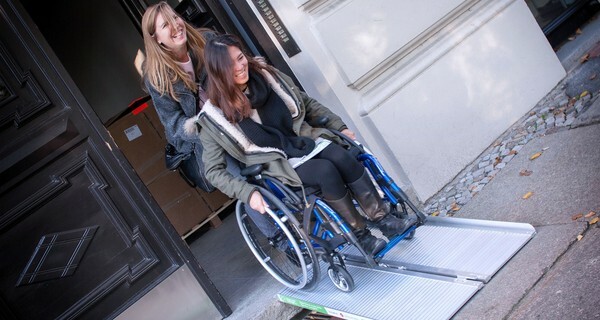 The information on which restaurants, cafés, museums or underground stations have a level access or a lift and which places are inaccessible makes it much easier for anyone using a wheelchair or a walking frame or pushing a baby carriage to plan their day and to navigate cities. The map, which is based on the OpenStreetMap, is available on the web and as an app for iPhone and Android. In its colour coding a ‘green’ venue is one that has a level access and a wheelchair accessible toilet. Yellow and red tags are given to venues depending on the height of steps, the presence of a portable ramp and the accessibility of toilets. On average three-hundred new places are marked on a given day by users around the world. Anyone can contribute to the map by providing the appropriate color code for a location that is currently tagged grey, or by uploading photos or text providing more details on venues that have already been rated as red, yellow or green. In addition to helping wheelchair users participate more easily in society, the map is also an effective advocacy tool. While on the one hand showing the progress that has already been made, it also illustrates the challenges that wheelchair users face because they do not have equal access to public life. The majority of the 500,000 marked places are in Germany but the map's use in other countries is rapidly increasing. To this end the map's makers are participating in a European project which is promoting the use of the map in more European cities. The site, which was developed by the German NGO „SOZIALHELDEN“, has won awards from German Chancellor Angela Merkel, European Commission VP Neelie Kroes and the UN.